HAVE YOU SEEN A BUMBLE BEE ON THE AUSTRALIAN MAINLAND? -- What harm could exotic bumblebees cause? Please report any Bumble Bee sightings to local authorities: contact details below. Help us keep exotic Bumblebees out of mainland Australia! Be on the lookout for Bumblebees -- click here for descriptions and photos. Keeping the Australian mainland free of Bumblebees will require much vigilance. 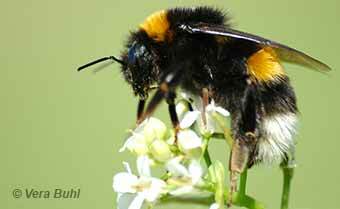 Feral European Bumblebees are now widespread in both Tasmania and New Zealand. It is quite easy for Bumblebee queens to hitch a ride to the Australian mainland on a ship or a plane. 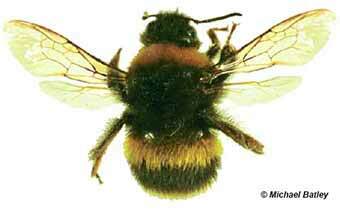 In May 2003, a Bumblebee queen was caught on Appleton dock in Melbourne. It was sitting on the back of a wharfie who was unloading a ship from New Zealand. In the same month a Bumblebee worker was caught foraging on flowers on Fisherman's Island wharf in Brisbane. There was also a report of a Bumblebee sighting in Sydney in 2018. -- In Victoria, phone: 136 186. -- In Queensland, phone: 13 25 23.